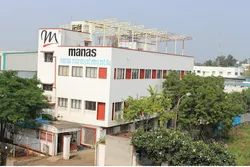 Established in the year 1998, we "Manas Microsystems Private Limited" are an ISO 9001:2015 certified company involved in manufacturing, exporting, wholesaling and retailing a wide range of Electromagnetic Flow Meter, Gas and Steam Flow Meter, BTU Meter, Process Instruments, etc. 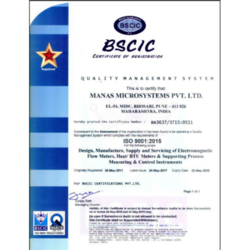 Catering to various industrial sectors, we provide our products including precision measurement instruments and industrial measurement instruments endowed with best-in-class recognition from our esteemed customers all over. 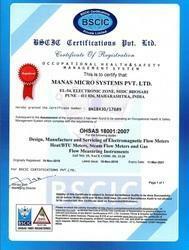 Our featured product has a key role in achieving such recognition during our decade-long existence in our specified domain. 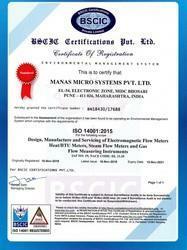 We have specialized ourselves in the design and manufacturing of the flow meters. Under the able, efficient and tactful guidance of our mentor Mr. Shrikant Sahasrabudhe, our company has deliberately climbed up its success storey by crossing over several leaps and bounds for over the years since its inception. 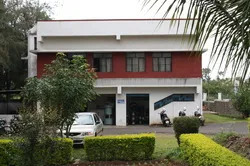 With a well-qualified team of devoted professionals and R & D engineers, we have been into providing world-class products including flow meter equipment as per the specified requirements of our customers. 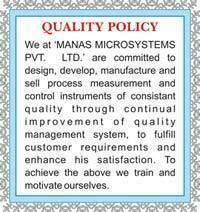 We at ''Manas Microsystems Private Limited'' are committed to design, develop, manufacture and sell process measurement and control instruments of consistent quality through continual improvement of quality management system, to fulfill customer requirements and enhance his satisfaction. To achieve the above we train and motivate ourselves. 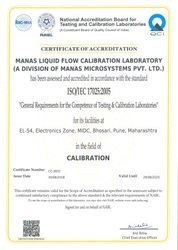 “Our Flow Calibration lab is now Accredited for ISO17025 by NABL ”.